As a homeschooling family, this is the time of year everyone starts talking about summer break. Warm sunny days are more frequent, flowers are in bloom, and outdoor activities hold more interest than school books. The day my kids changed our classroom calendar to May, I began scanning where we are in all of our curriculum. I needed to set a date to finish our school year. Before I could make any final decision, the question was voiced, “When are we starting summer break?” Of course it came in whiny voices and eye rolls as my young scholars sat around the table to begin their assignments. “With those eager attitudes for book work, I think we should plan summer school!” I responded with exaggerated enthusiasm. My banter was met with loud groans, laughter and claims of child abuse. Joking aside, I’m looking forward to summer as much as my kids. I have gone through the status of each subject’s lesson plans. Four lessons of science, four weeks of school, one week of end of year testing. Yes! I have to confess, the entire time I was planning the end of school, I also entertained visions of singing “In Summer” while dancing with Olaf…. It’s okay if you didn’t finish the lesson plan! GASP! I know, you’re in shock right now. But seriously, it’s okay if you don’t finish every lesson in every book to the bitter end. Your kids are not going to suffer if you don’t finish every single page of math drills. My kids are not going to suffer if we only get through two or three of our remaining science lessons. Success is not about how many assignments your students finish. Success is better measured by teaching them to love to learn. Do something new! The school routine can get really boring at the end of the year. Curriculum that was once exciting becomes routine and dull. A small change can help recharge the fun of learning. Do a craft. Take your read-a-loud outside on a blanket. Write limericks and see whose is the silliest. Build a large piece puzzle together. Play a game. Make sure you are meeting your state’s requirements for homeschooling. If you are required to maintain records, make sure they are in order. If you need to schedule testing, get it done. We test yearly, and I have had to order materials and schedule testing time. Set a date to end school, and put it on the calendar! If your kids are like mine, they are going to be crazy excited about the beginning of summer break. Even though you may want to control their energy until you are through lessons, they need to know the end is in sight. It’s exciting for them to know they will successfully finish the school year. Celebrate! Rejoice in how much everyone grew through the year. You worked hard, and so did your kids. On our final day, we have a special treat and talk about what we learned. It’s a great time to get feedback on how my kids felt about curriculum, what they learned, and how they felt God spoke to them through the lessons of the year. It’s also a good time to ask what they might want to learn about next year. Don’t start planning a crazy busy summer! Focus on finishing the school year, and then relax. The first week of summer I don’t plan anything. We play games, we go to the park, we simply enjoy not doing school. 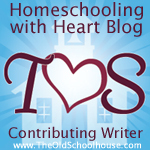 Homeschooling is hard work, but it’s also good work. Make sure the hard lessons don’t take your focus away from what is good. Look for ways to end your school year well, and make sure you take time to have fun! 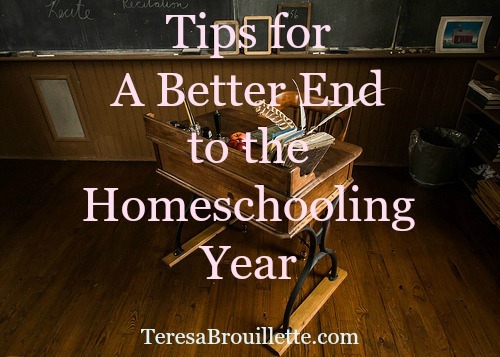 What tips would you add to make for a better end to the homeschooling year?